The standard approach to positive blood cultures has not changed for many years. Traditionally, following Gram staining, positive blood cultures were sub-cultured for an additional day or two before the organism could be identified. The Gram stain is quite useful in guiding choice of empiric anti-microbial therapy for Gram positive vs. Gram negative organisms. Blood culture Gram stain results are considered a critical value and are communicated to a caregiver immediately, so that appropriate anti-microbial therapy can be established. However, the final identification for most Gram positive cocci in clusters is coagulase-negative staphylococci, which are potentially blood culture contaminants for which antibiotics are unnecessary. Coagulase-negative staph accounts for 70% of all staphylococcal isolates from SLHS blood cultures. Furthermore, the Gram stain does not differentiate between Gram negative enteric organisms vs. Pseudomonas species, which in many cases necessitates very broad-spectrum anti-microbial therapy until the organism is fully identified. The standard time for identification of an organism from a positive blood culture is 1-2 days. New technology, called PNA FISH, provides more complete information than the Gram stain on the same day a blood culture becomes positive. PNA is a synthetic Peptide Nucleic Acid made up of oligonucleotide bases with a peptide backbone. 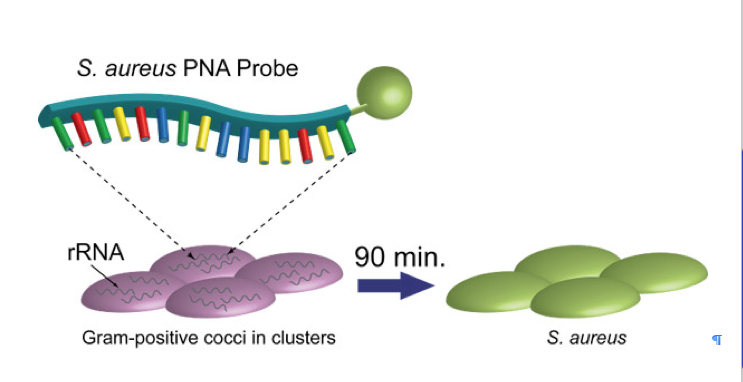 The PNA probe is fluorescently labeled and binds to species-specific 16S ribosomal RNA. Once a blood culture turns positive, a Gram stain is performed and based on the results the appropriate PNA FISH test is selected. A drop from the positive blood culture is fixed onto a microscope slide. A PNA probe is added and allowed to hybridize to the rRNA within the target microbes. After excess probe is removed by washing with buffer, the slides are visualized with a fluorescence microscope. Several products are currently available from Advandx. S. aureus/CNS PNA FISH allows microbiologists to rapidly differentiate Stapylococcus aureus from coagulase-negative staphylococci. Green fluorescing cells identify S. aureus while red fluorescing cells identify Coagulase-Negative Staphylococci (CNS). The absence of fluorescence indicates another species is present in the positive blood culture. EK/P. aeruginosa PNA FISH provides rapid identification of both E. coli and/or K. pneumoniae and P. aeruginosa on smears made directly from Gram-negative rod (GNR)-positive blood cultures. E. coli and/or K. pneumoniae is identified as multiple bright green fluorescent rods in multiple fields of view, whereas P. aeruginosa is identified as multiple bright red fluorescent rods in multiple fields of view. The absence of fluorescence indicates another species is present in the positive blood culture. E. faecalis/OE PNA FISH provides rapid identification of E. faecalis from other enterococci (OE) on smears made from positive blood cultures. Enterococus faecalis can be differentiated from other enterococcal species that are potentially vancomycin resistant. Green fluorescing cells indicates E. faecalis while red fluorescing cells indicate other enterococci, including Enterococcus faecium. The absence of fluorescence indicates another species is present in the positive blood culture. GNR Traffic Light PNA FISH provides rapid identification of the three most prevalent Gram-negative species on smears made directly from Gram-negative rod (GNR) positive blood cultures. Pseudomonas can be differentiated from gram negative enterics, including E. coli and K. pneumoniae. Green fluorescing cells identify E. coli, yellow cells identify K. pneumoniae and red fluorescing cells identify P. aeruginosa. The absence of fluorescence indicates another species is present in the positive blood culture. Yeast Traffic Light™ PNA FISH provides rapid identification of up to five Candida species on smears made directly from Yeast-positive blood cultures. This assay uses fluorescently labeled peptide nucleic acid (PNA) probes that target the species-specific ribosomal RNA (rRNA) of C. albicans, C. parapsilosis, C. tropicalis, C. glabrata and Candida krusei. Results are visualized using fluorescence microscopy. Green fluorescing cells identify C. albicans and/or C. parapsilosis, yellow fluorescing cells identify C. tropicalis and red fluorescing cells identify C. glabrata and/or C. krusei. A negative result indicates the absence of these five organisms. PNA FISH results are reported on positive blood cultures in addition to the Gram stain result. PNA FISH testing facilitates more appropriately targeted anti-microbial therapy, as well as avoidance of unnecessary anti-microbials. Some published studies have also indicated cost savings due to decreased length of stay and improved patient outcomes.